On the internet, social networking is the process and practice of individuals, businesses and other types of organizations to interact with each other through common web sites and specialized areas within those websites for the purpose of sharing, gaining, propagating and discussing all manner of information. The first significant Social Network online was AOL which offered countless chat rooms, discussion groups, news groups et al whereby individuals shared common space and common interests to share or promote ideas, experiences, insights as well as simply to talk and connect with others, if for no other reason to make a new friend or just have someone to talk with. In recent years, social networking online has literally exploded along with the growth of the internet and new internet technologies and capacities. MySpace hit the scene and was a smash providing people to the opportunity to create their own pages, invite friends, post content in the form of music, photos and virtually anything digital. This is my first recollection of truly viral online phenomenon; creative individuals with great music or other content had their creativity shared exponentially by more and more people. The best ones even made it to traditional media for being internet wonders. YouTube has seen even wider acceptance and usage over the past few years providing anyone the opportunity to post home-made videos. One out of every 4 searches on the internet today is a YouTube search seeking multimedia content for countless topics and interests. Facebook, and more recently, Twitter have exploded on the scene providing two very popular portals with distinctly different approaches. Facebook is more of a personal networking site as it promotes “reconnecting” with old high school, college, post graduate and former corporate friends and associates. Many have extended their networks to include commercial interests as well. Blogs, in and of itself, a form of social networking, is often linked through RSS (Really Simple Syndication) on Facebook pages so those within one’s personal network can view the blogposts on the home page of the Facebook user. Twitter is not as personal as Facebook in my estimation. Twitter is a microblogging site that limits all single posts to a limit of 140 characters and is intended to answer the question “What are you doing now?” While simple on its face, Twitter’s open interface has paved the way for countless tools and utilities that allow users to build large networks of followers. In fact, following others and being followed is central to the Twitter experience … whether or not you have ever met the Tweep before. You can just start following people or you can use Twitter’s Search to seek Tweeps that with similar interests or ones who have specific interests or expertise you wish to get involved in. Building a large loyal network of followers can be very powerful if you are able to provide your followers with worthwhile comment and content that is unique, helpful, entertaining and engaging. For example, you can Tweet about a new blogposts or article or song that you’ve written and link to it. If your content is great, you will find that more and more Tweeps will follow you. 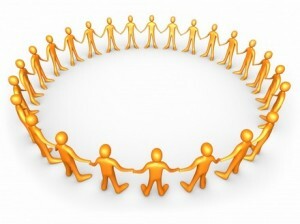 Linked-In is commonly used by business professionals with like-minded interests and activities. It is just another social network but structured and designed for business professionals. Here you can post your resume, your interests, receive and give personal and professional recommendations. As with Twitter and Facebook, and for that matter, all social networking, the more you give to your network, the more you will receive in return. Kind of like life offline as well, don’t you agree?